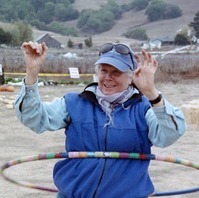 I am a workshop leader and educator with over 35 years of experience designing programs which inspire and build deep connections to ourselves, each other, and the natural world. With 40 years of Buddhist meditation practice and 25 years of yoga practice, I use mindfulness and movement techniques to increase awareness and connection to our inner knowing. As a facilitator of the “Work That Reconnects”, I use my theater background and deep nature connection to create powerful experiences for participants. Having studied with Joanna Macy for over 20 years I am steeped in the Work and able to design and deliver workshops which address a wide range of issues; climate change, racial wounds, relationship to money, elderhood and aging. I am also a yoga and mindfulness teacher bringing the wisdom of these ancient practices into the modern world. Designed, initiated, and managed seven successful education programs.